Many dynasty fantasy football players will tell you that the startup draft is the most enjoyable part of any league. With a blank roster in front of you it seems that anything should be possible. For most players though, the sad truth is that anything is not possible. There are a number of things to prepare for and consider when creating your startup strategy this year and if you ignore these factors it will take a lot of luck for you to avoid flunking your draft, especially if you are new to dynasty. In this piece, I’ll build upon part one. I’ve also covered preparation strategies for snake draft startups and I recommend you read that piece as well since some principles are transferable. I enjoy auction startups because they offer more flexibility with regard to team-building strategy. You are always in control of your ability to build your roster as long as you effectively track and manage your bankroll. 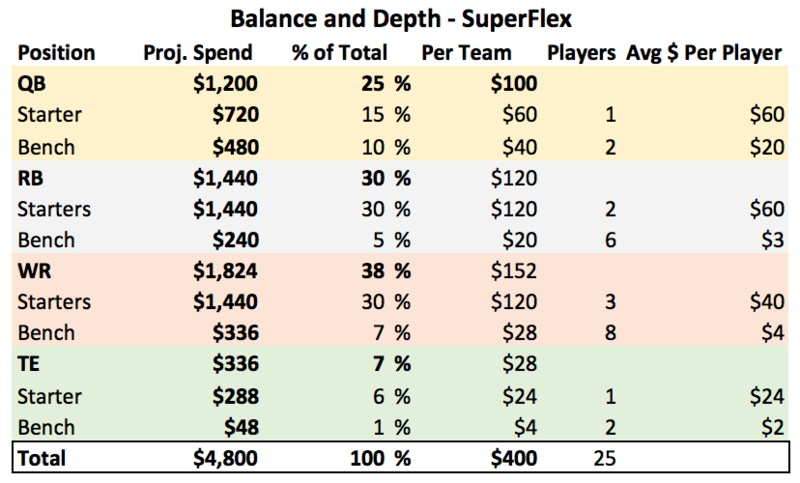 While there several viable build strategies and every drafter is a bit different, two primary options are building for depth and building for ceiling. 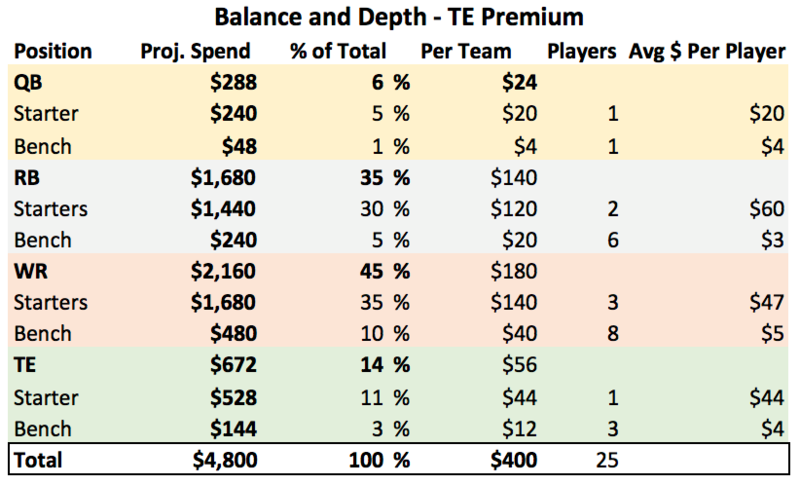 Building for depth will insulate you from injuries and retirements but can come at a cost of missing on top-level players at each position (because you have to preserve funds to be able to buy higher-end bench players). 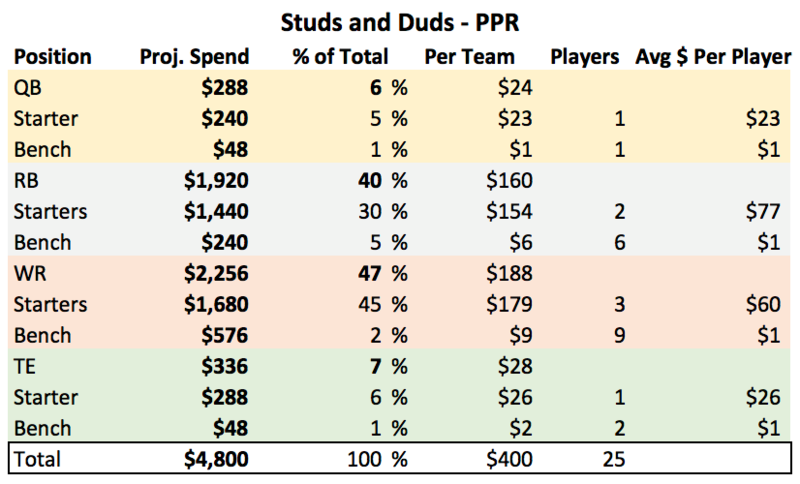 Studs and Duds (as it is affectionately called, whereas it’s effectively actually “Studs and Lottery Tickets”) is a strategy where you spend a very high percentage of your cap space on elite players and fill the bottom of your roster with $1 or $2 players. This build strategy can really pay off if you hit on a couple of your cheap flyers to serve as bye-week and injury depth. If you miss on them though, it could be a short road (one or two injuries that significantly impact dynasty value) to a rebuild for your team. 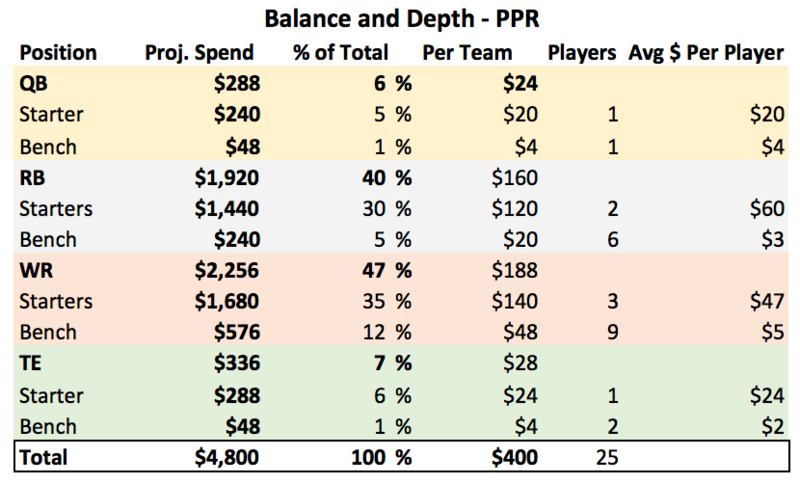 In order to build your auction budget strategy, you’ll need to know the total cap number available to spend for each team and the number of roster spots. You’ll also want to have a plan already defined for how many roster spots you want to set aside for each position in your build. Below are some reference charts you can use when preparing your auction budget strategy. I’ve included options for balanced builds and studs and duds builds. I’ve also adjusted the charts to cover the most popular scoring and lineup settings, including PPR, Superflex, and TE Premium. 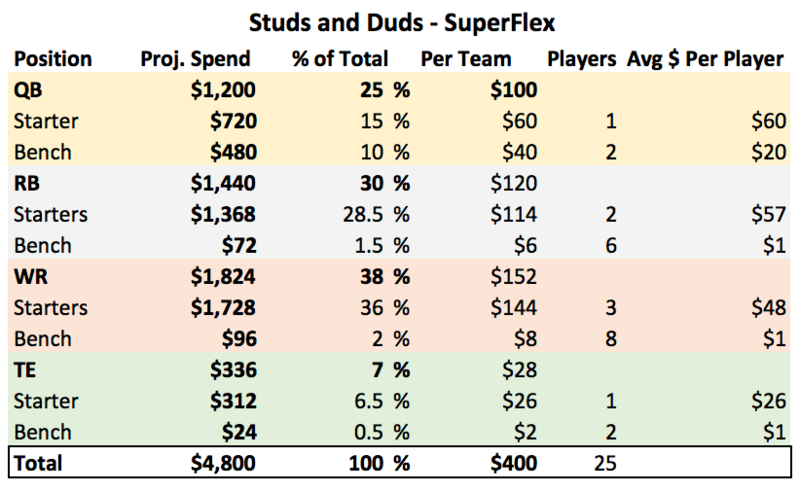 I built them to cover setups based on a $400 auction budget for each team and 25 roster spots. I assigned roster spots to each positon based on how I typically construct a dynasty team. The “% of total” column is perhaps the most important takeaway. 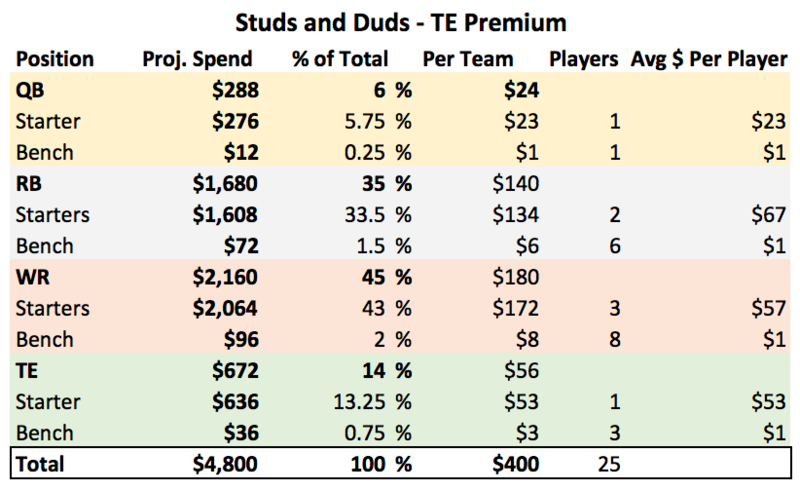 If your league is set up similarly but is based on a $100 cap, for instance, the budgeted percentages would still hold despite the dollars allotted changing. These are meant to serve as a baseline that you can adjust based on your personal tolerance for risk and preference for positions in which you tend to invest the majority of your draft capital. You don’t have to hold tightly to the guides to still draft in the spirit of the strategy. For example, you might buy a couple players for $4 or $5 in a Studs and Duds build because the values were on the board. This is fine, but you’ll have to adjust you top spend at a Stud position downward to compensate. Once your auction has started you’ll want to track the total number of dollars remaining for each team in your league. You’ll also want to keep track of each team’s maximum bid; this is vitally important toward the end of the auction as you can place specific bids to price a desired player out of the purchase range of a competitor. You can set up an excel sheet to keep track of this for you. Let’s create an example using what a “Studs and Duds” build methodology might look like about halfway through an auction. As you can see above, your team has draft 14 of 25 total roster spots and has $72 left spend. The max bid you can make on a player at this point in your auction is $62. How do I know this? If you filled 10 of the 11 remaining spots with $1 players then you’d still have $62 left. You can set up calculations in excel to track this for you and your max bid available cell will dynamically adjust as you fill in your purchases. If you overspend or underspend on a position group, remember that you can adjust on the fly in the auction and assign the savings (or subtract the overage) to another part of your roster. You can remove almost all the stress from the dynamic auction environment by understanding the importance of having a team-building plan and having a defined budget that matches your plan. Once you’ve completed these steps the auction can just be a fun experience where you build your winner by choosing players that fit your strategy and your budget. Now go build your winner.